The sophistication and elegance of Laurel Manor will take your breath away the first time you enter. The venue is made up of a grand lobby, marble floors, two winding staircases, and majestic chandeliers in addition to their large but intimate reception halls and ceremony spaces. This venue is not simply a place to have your event but also offers full service wedding packages. 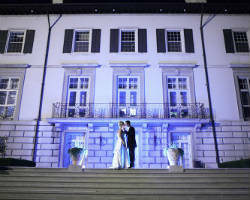 These packages include catering, cake and rooms for the bride and groom to get ready and spend the night. The Shriners Silver Garden Events Center is where the magic of your big day becomes a reality. They are not just a venue with one party room but rather one with many ballrooms and outdoor options to choose from meaning your event will entirely suit your essence as a couple. Their lush gardens with a gazebo act as the perfect garden wedding venue while the ballrooms are the best places to party. 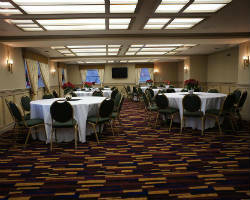 The luxurious space can accommodate up to 415 guests for a sit down dinner or smaller parties. If you are looking for a full service venue in a historic location, look no further than the Inn at St. John’s. 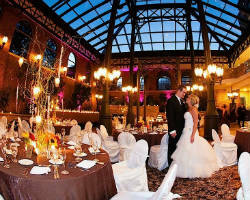 They offer four different ballrooms that can be styled to match the size and spirit of your event. They also have an outdoor courtyard and lush gardens if you prefer to have your event in a fresh outdoor environment with a fresh feel. In addition to the reception areas there is also an onsite wedding chapel, which is the perfect space for a traditional Catholic wedding ceremony. 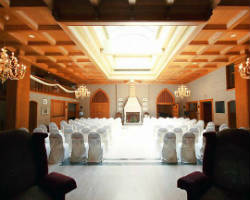 The Masonic Temple is everything from a party venue to a banquet hall and a wedding chapel. The intimate setting this venue provides will not only make you feel more comfortable when saying your ‘I do’s’ but it will also put your guests in the mood to witness and celebrate the special love you and your partner share. The dark wood and low lighting create the right ambience for a lovely traditional wedding day or can compliment a more modern wedding style. A war memorial might seem like an unusual choice for a wedding but once seeing the gorgeous grounds and house, you will be convinced that this is the perfect place for your fairytale wedding and reception. There is a large reception room, library, dining room, and ballroom in the historic house on the property that offer a warm and welcoming spirit to the reception. The house and particularly the ballroom overlook the lake nearby making this one of the best small wedding venues in Michigan. It is difficult to read the reviews of the Roberts Riverwalk Hotel and not be convinced to have your wedding reception there. With their competitive prices and timelessly beautiful spaces as well as incredible views, you can be sure that your event will have an amazing backdrop. There are spaces in a variety of sizes and styles for you to choose from meaning the space you choose can accommodate you and your guests perfectly in the exact style you choose. The Detroit Princess Riverboat is one of the few Detroit wedding venues that will float you and your guests around as you celebrate. 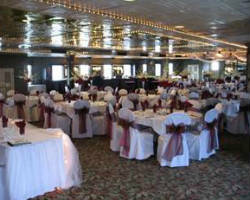 There is a large dining room on board as well as a dance floor to host your wedding reception. Though this is not a cheap reception option, it is one of the most romantic. As you float along you can overlook the city and the water and take in the beauty and majesty of the backdrop and landscape. 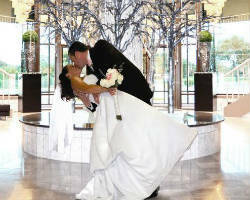 The San Marino has been hosting banquets and events for years and has hosted countless wedding receptions. 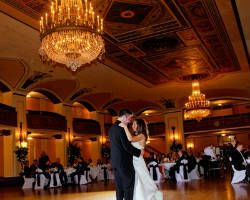 This venue will make you feel like you’re on top of the world in their regal ballrooms. Not only does this venue host events but they also help couples plan and provide catering as well, meaning they are the one-stop wedding reception gurus. The space is not only affordable but also can be used for a variety of large gatherings like corporate lunches or Quinceaneras. 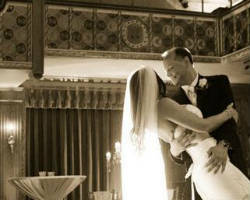 Imagine having your wedding at the theatre; a place that has told countless love stories can now be the home to yours. 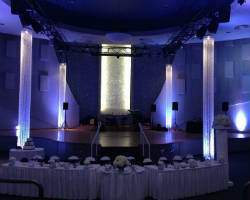 This venue has the massive theatre itself but also a large car park for guests, a luxurious lobby area, and a garden patio as an outdoor option. Whether you are a huge fan of the theatre or just enjoy the grandeur of the space, the wedding associates at the venue are there to help you arrange the space perfectly for your event.